I've blogged twice in one month about natural products I'm currently digging: my Naked Kitty deodorant and the super-biodegradable Glitterevolution which says bienvenue to glitter fun but au revoir to microplastics, and both times, Green Tree Beauty has been the place to get 'em. But those aren't the only products I'm into from the Green Tree-- y'all, everything I've tried has been a goodie. So rather than blog back-to-back product like I TOTALLY COULD, I thought I'd just give you a peek at this local Saskatoon shop that's gained a fan club all over Canada and the US. Founder and Owner, Jennilee Cardinal-Schultz is a friend of mine and deserves all the kudos for her success in curating the best-of-the-best products which just so happen to be approved by Mother Earth, so please join me in giving her some applause. Although Green Tree now takes a big part of her days, Jennilee is a Professional Makeup Artist. I've worked with her on set many times over the last ten or fifteen years, and have known her kit to include everything under the sun so you can trust she's tried it all. Gradually, she curated her favourites that followed her philosophy of being kinder to the environment and happily, that included a lot of locally-sourced products like Apotheca Borealis Skin Care which is the only line to feature Saskatoon berries, one of nature's most concentrated sources of antioxidants. I personally use the Apotheca Borealis Saskatoon Berry and Royal Jelly Serum at night and have found that despite all the sun I've been getting, my skin looks younger. I should have taken a before and after but I didn't expect anything noticeable. Plus, I'm not sure if it's that or the Viva Amaze Exfoliating Gel which I started around the same time. ANYWAY, back to the story. Once Jennilee was using the products on herself and clients, she wanted to share her high-standard collection with more people, so, she set herself up as a distributor out of Saskatoon's Alchemy on 2nd Ave. But who knew there would be so many people with her same mindset in search of a good guide? Whether people were looking for vegan, cruelty-free, organic, reusable packaging... she basically just knew her sh*t and Green Tree Beauty took off. 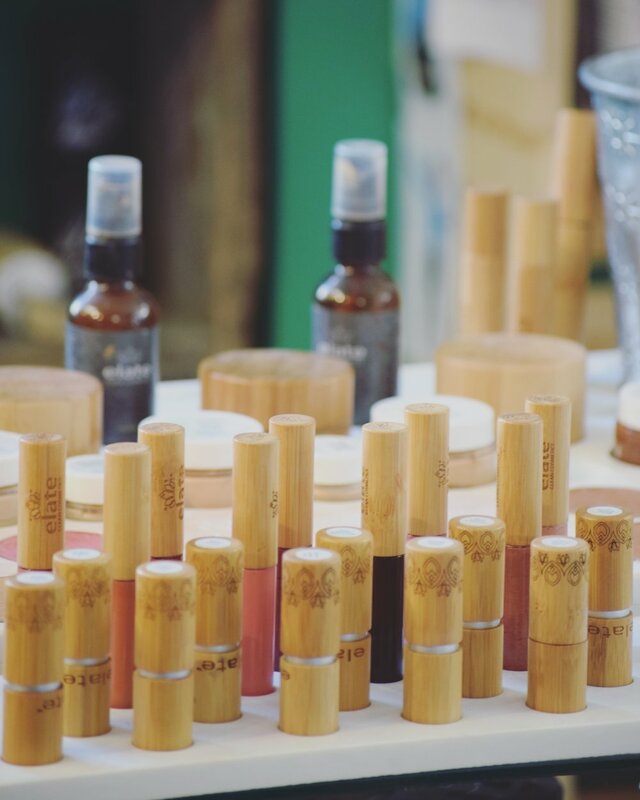 Elate Cosmetics lip glosses, for example, are natural, vegan, cruelty-free, and sustainable. "This company is from Victoria, BC and a leader in what they are doing," Jennilee told me. "I use their stuff on set all the time so I can vouch that it's high performance but what I love the most is the sustainability and cruelty-free parts of the story. Their idea of cruelty-free extends to humans as well as animals. They won't use mica that's mined by slaves or children and for sustainability, they use bamboo when they can instead of plastic, they package their pressed powders in seed paper and sell reusable bamboo compacts so that you buy the compact once (just pop in your eyeshadow and switch it out when you're finished), and the seed paper can be planted to grow herbs so there's pretty much no waste." Green Tree Beauty now even has house brand products like a lip sugar scrub and a balm. Just wanna hug her, I'm so proud. If you're in Saskatoon, pop into Green Tree Beauty at Alchemy to check out Jennilee's favourite products in person or, if you're not a local, visit the shop online. Every product on the site is well-detailed so you know exactly what you're getting and their tree-planting initiative is awesome: just this year, Alchemy and Green Tree planted 6000 trees by hand alongside friends and volunteers so you know they're in it for the passion. ***CONTEST ON, FROM NOW UNTIL JULY 12*** Win your way into a collection of my favourites from Green Tree Beauty! Viva Amaze Exfoliating Gel, Apotheca Borealis Saskatoon Berry and Royal Jelly Serum, Naked Kitty Deodorant, a Brush Naked Toothbrush, and a Green Tree Lip Scrub, for a total value of $103! See the @sneakersandlipstick Instagram or the Sneakers & Lipstick Facebook page for details.